In hopes of attracting the attention of today’s demanding customers, marketers often spend inordinate amounts of time designing the “perfect” loyalty program for their brands. But the same consideration is not extended to how the program will actually be carried out, how its success will be measured, or how the enthusiasm will be maintained. 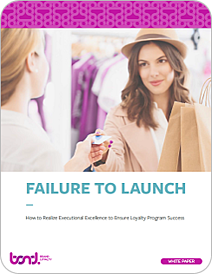 Based on our webinar "Measure Twice, Cut Once", this white paper will get you started on creating a plan to drive implementation excellence for your new or existing loyalty program.